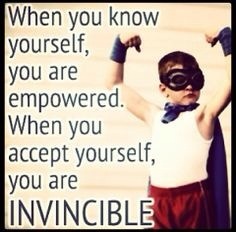 Accepting yourself is an extremely powerful thing! Your flaws, your shape, your abilities and your emotions are who you are. So empowering yourself to accept each one is such a brave thing to do and in that we can find the courage to improve the flaws or embrace them. It us up to us! It us up to me! Next New Dawn! New Day! New Out Look!